Def Leppard was a huge influence on me growing up. Most of the metal and hard rock bands I listened to were from America. Def Leppard, along with Iron Maiden, were the most important bands that hit me out of The New Wave Of British Heavy Metal movement. The bands first three albums blew me away…all edgy, hooky and heavy in a way that was completely original and legit. Def Leppard has obviously had their fair share of problems over the years: drummer Rick Allen lost his left arm in an auto accident; guitarist Pete Willis was asked to leave the band due to a severe drinking problem; and that brings us to Steve Clark. 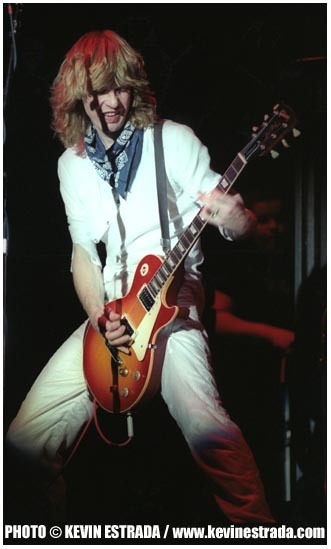 Steve Clark was one of the main contributors to the band’s music, lyrics and sound. His live performances were quite memorable, he was always on fire. Despite the creative genius that was Steve Clark, his musical work with the group was increasingly interrupted by his severe battle with alcoholism. Clark’s battle began in the early 1980’s and increasingly grew more and more dangerous to him and the band. Alcoholism was seriously damaging his musical career. At the time of his death, his band-mates had placed Clark on a six-month leave of absence from Def Leppard in an attempt to reform the guitarist. Although I have met and photographed Def Leppard a few times, I never had the opportunity to meet Steve Clark. In memory of Clark, his band-mates wrote and recorded the song White Lightning – honoring Clark’s preference for white clothes on stage. Check out my photo…he is dressed all in white. Like many of the local bands that I would see as a teen, Ratt had emerged victorious – growing from a local, unsigned band to one of the biggest arena rock bands in history. 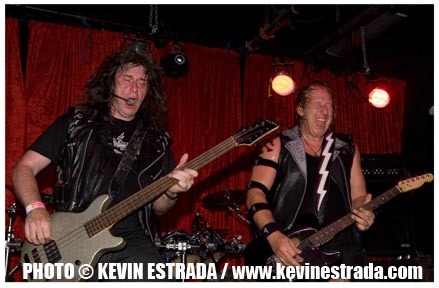 I saw Ratt climb to stardom, step-by-step…it was a great time for Metal and Hard Rock. 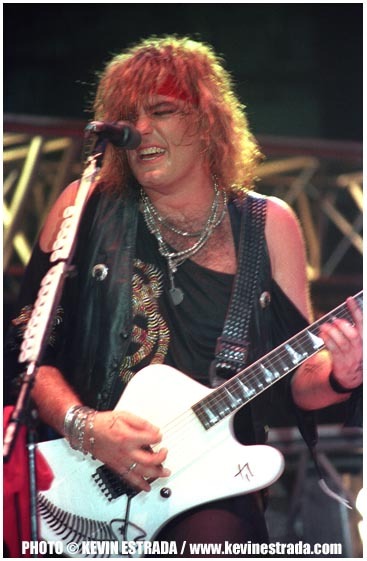 Robbin Crosby teamed up with Ratt in 1982 and was a major force in Ratt’s songwriting and hit songs. Round And Round, Back For More, Lay It Down – all Crosby’s handiwork. 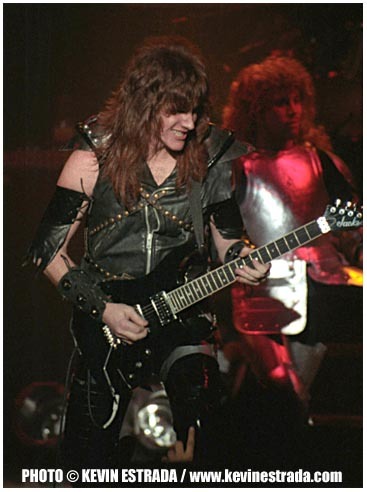 There was always a rumor floating around that we used to hear back in those days; that Crosby’s band-mate Warren DeMartini seemed to get more attention and more praise than Crosby, regardless of the fact that Robbin Crosby wrote so many of the bands hit songs. This rumor is what eventually led Crosby down the dark and lonely road of drug addiction. Crosby truly lived the rock and roll lifestyle that everyone has read about and soon became a habitual heroine user. Despite the drug use, Crosby always remained a sweet and soft-spoken person, dedicated and appreciative of his fans. Eventually his heroine use became much more severe and was seriously affecting his playing on stage, eventually forcing Crosby to exit Ratt. In early 2001, Robbin Crosby publicly announced that he had full-blown AIDS. A year later he was found dead of a heroin overdose, not AIDS as many believe. Unfortunately, my last memory of Robbin Crosby is not a happy one. I was walking out of a now defunct comic book shop named The Fantastic Store on Highland in Hollywood. As I walked to my car, I saw Robbin – in the alley adjacent to the parking lot, scoring heroin from some filthy dealer. Robbin had lost everything to heroin – his family, his career, his home, his belongings. He looked horrible, the man who was fondly referred to as “King” was dirty and had put on massive amounts of weight. Shortly after this, “King” was gone. It was very saddening for me to see one of my teen heroes like this. It is an image that I don’t think I will ever be able to forget. 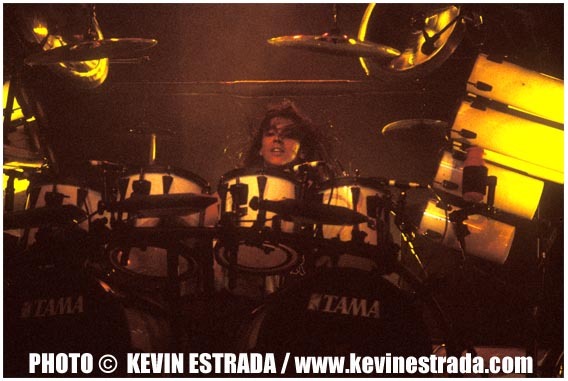 It was on Ozzy Osbourne’s No Rest For The Wicked Tour that I first really noticed the greatness in Randy Castillo’s drumming. I am not a drummer or an drum critic by any means, but what I gathered was that Randy was not the greatest at copying parts that other drummers wrote, he was great at being himself and creating his own feel. 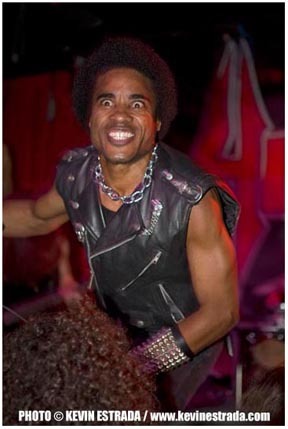 Castillo was plagued with serious ailments that forced the drummer to pop in and out of tours during his career. Just before he was set to tour with Motley Crue in support of New Tattoo, he was diagnosed with an extremely serious ulcer that had ruptured his stomach. While recovering from his surgery, Castillo found a small lump on his jaw. Within a month, the lump had grown to the size of a golf ball. The diagnosis was a common form of skin cancer. A few months later this monster got the best of him. I was fortunate enough to have hung out with Randy just prior to his passing one night at The House Of Blues in Los Angeles. 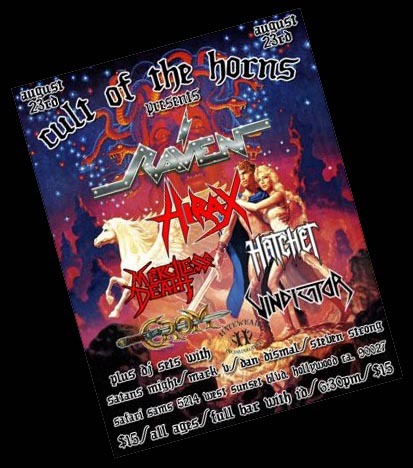 Mike Inez of Alice In Chains introduced me to Randy and they excitedly told me about a new band that they were working on together. Inez had always told me that Randy and I would get along great…and he was right. The moment Randy found out that my father also grew up in Albuquerque, New Mexico we were instant pals. Shortly after that the Rock World was reading his obituary. Like a lot of Metal Kids my age, my interest in Quiet Riot stemmed from my fondness and appreciation of guitar god Randy Rhoads. It is no secret that Rhoads fame and, unfortunately his death, brought many fans to the new Quiet Riot camp. I was never a huge Quiet Riot fan, although I did see them a handful of times during their ’83-’84 Metal Health Tour. 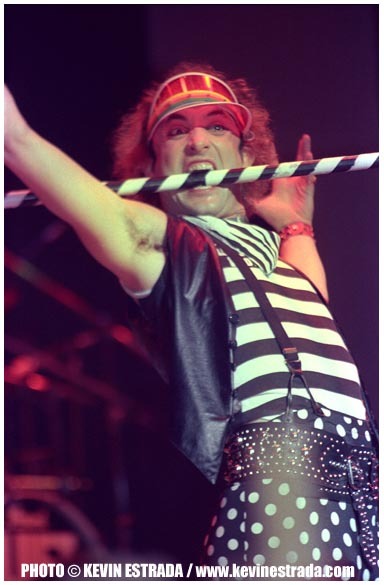 Depending on whom you talked to, Kevin Dubrow was either a fantastic front-man or one of, if not THE, most annoying man in rock at the time. I was team captain on the “annoying” team. His feud with Van Halen’s David Lee Roth stands out in my mind…it was some silly Junior High type stuff. I met Dubrow a couple of times, and as annoying as he was on stage, he was one of the nicest guys and coolest guys I have met. He was surprisingly soft-spoken and listened to me when we spoke – which really blew my mind. You are currently browsing the the KEVIN ESTRADA blog blog archives for August, 2008.